Schmetz have improved the design for this embroidery needle with the incorporation of a larger eye/grove, improved scarf, and more rounded point, allowing the embroidery needle to accommodate heavier embroidery and metallic threads. This embroidery needle also reduces skip stitches and avoids damage to fabric and previously sewn stitches. These embroidery needles are our best selling embroidery needle pack and it's not hard to see why. Schmetz have been creating machine needles of the highest quality since 1851. 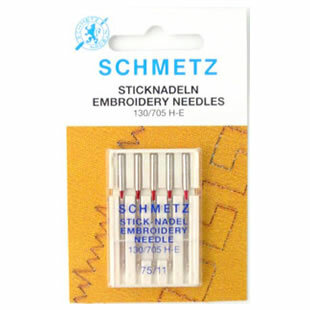 At Lords Sewing we use Schmetz Needles for all our embroidery projects, sewing projects and recommend them as the needle of choice for creating wonderful embroidery.